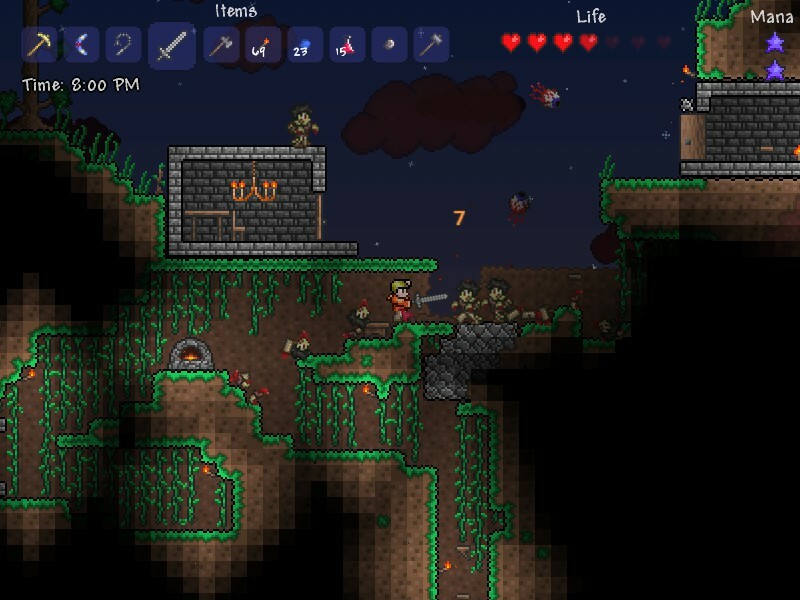 Terraria is one of those games that is simple to write off as a shallow rip-off. 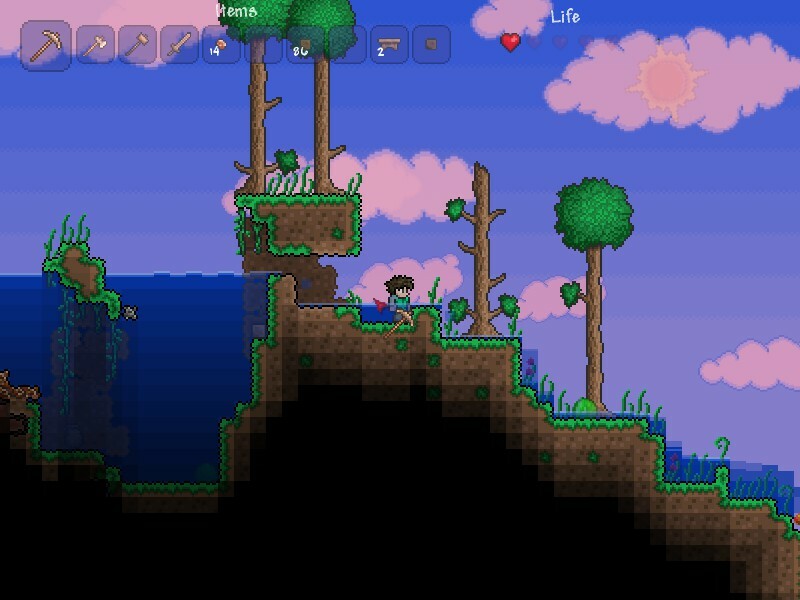 The comparison to Minecraft is immediate and frequent, but we at BrainLazy aren’t here to judge books by their covers, so I spent some time with the game to see what, if anything, it had to offer aside from the popular “Minecraft in 2D” descriptor. The answer is simple: It has A LOT to offer. This game goes the “retro” route with its visuals. This is one of the many many features it shares with Minecraft. 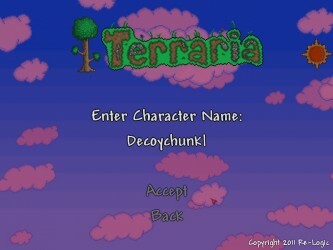 The graphics are roughly on par with the 16-bit era video games, resembling a well made SNES platformer at a glance. Lurking behind those simple visuals, though, are a number of tricks and techniques that really give the world a feeling of depth and detail. The most obvious one is lighting. Different types of material let light penetrate to different degrees, and everything lets at least some light through. 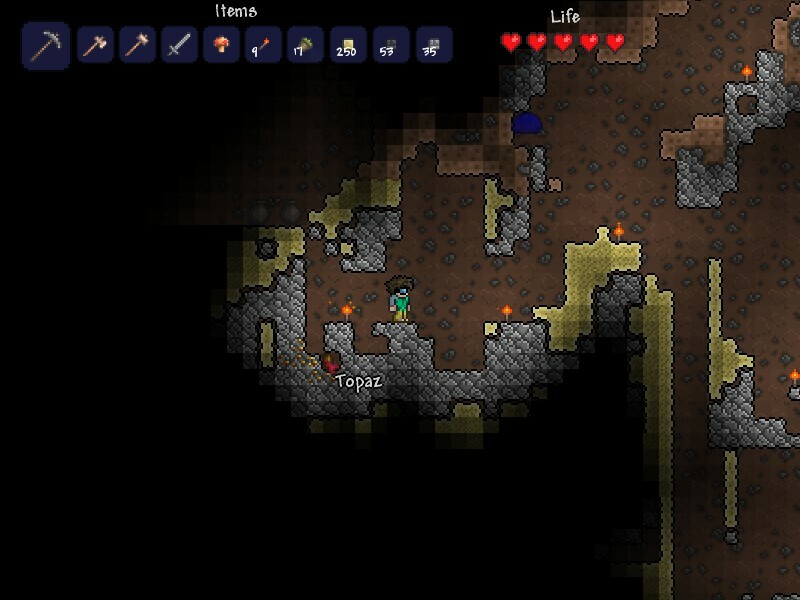 This not only means that bright light digs at least a few blocks into solid ground, showing you what you are digging toward – something that Minecraft notably lacks – but as you knock away bits of stone and slice away cobwebs and vines, the illumination of the world around you changes. 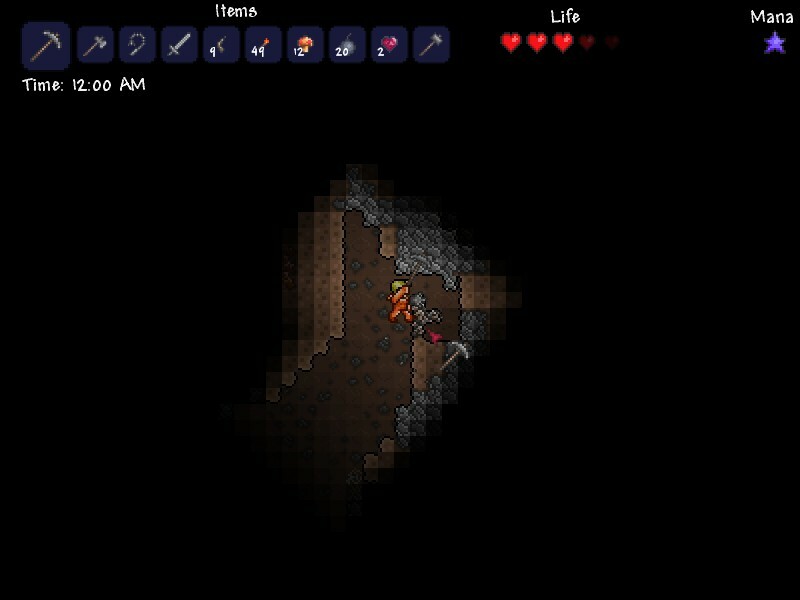 Subtle shadows of stone walls vanish when you harvest them, and that torch in your hand gets a whole lot less useful once you go underwater. Torches drop embers that trail light behind them, the foliage high above you in the trees catches the light of your torch. Good stuff. 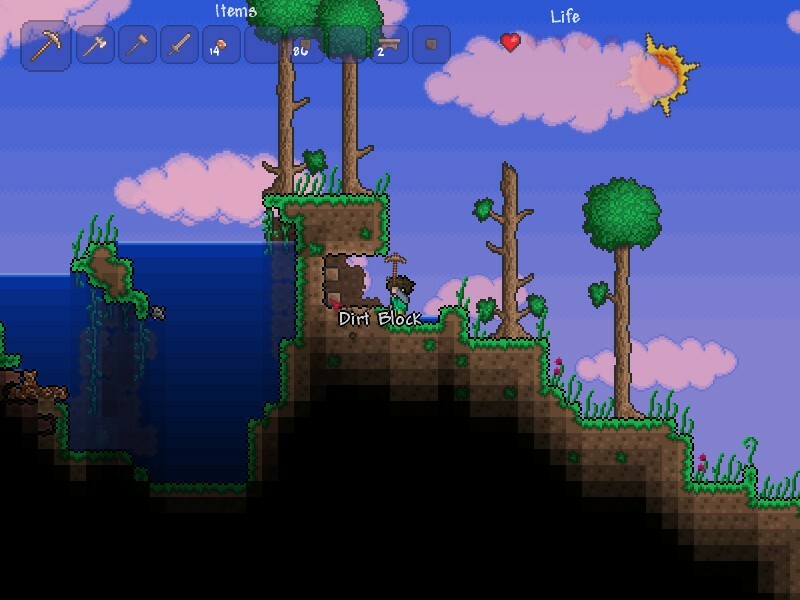 Another visual effect I get a kick out of is the water leveling. 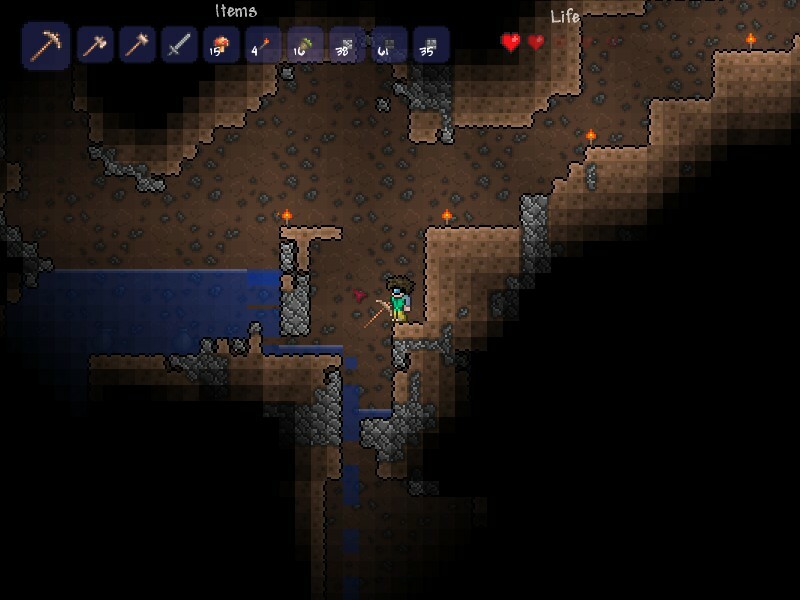 When you poke a hole in the wall separating an underground lake and a cavern, a stream of water immediately starts to trickle down, the level on one side dropping and the other side rising. As it tries to find its level it will sweep across flat areas (seriously screwing with any torches you may have placed) and leaving puddles in its wake. Water, particularly on the surface, is frequently found with sand, which has its own interesting behavior, because as in Minecraft, sand is one of the few substances subject to gravity. It comes down in an avalanche of loose blocks which can stack again. And it is HERE that I shall make my stand! Little touches make the environment seem absolutely vibrant and alive. Vines drop down from under dirt that is exposed to sunlight, grass and flowers grow on top. A swing of a tool or even an opening door will clear this growth away, only for it to return in time. Every naturally occurring brick blends with those beside it, doing away with the pixel perfect divisions that make Minecraft so popular for pixel art. The result is much more organic. Is it bad that I happen to know the RGB value of my usual Creata-a-Character shirt color? 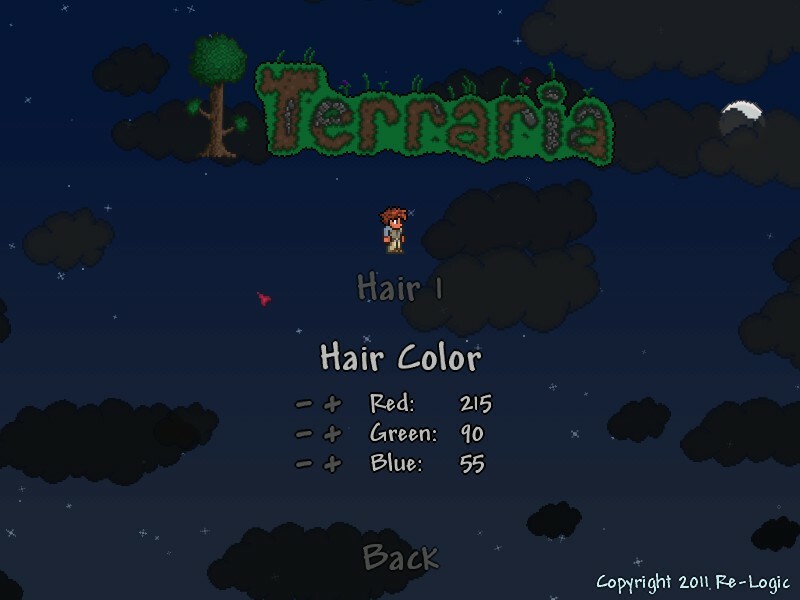 The player character is fairly customizable at the main menu (hair color, shirt color, etc) but before long these changes will be buried beneath weapons and armor that, impressively, aren’t just palette swapped versions of the same sprites but distinctive in their shape and appearance based on their material. Besides the various flavors of slimes, there is actually an impressive amount of enemy variety, working from little floating eyes to massive all-devouring boss worms. Sure, I could have just used a candle, but his house is for the demo man, so I'm going with a chandelier. 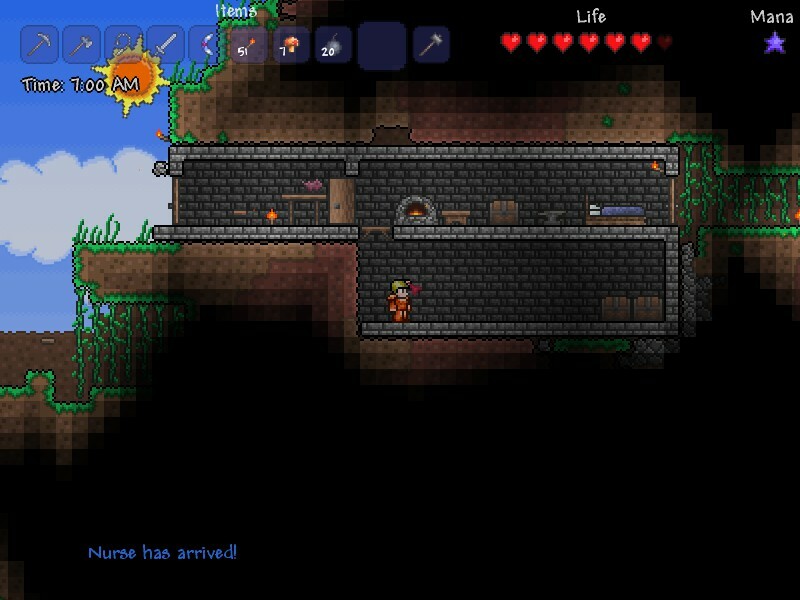 The type of gameplay you can expect from Terraria depends largely on how far into the game you are. Initially, it is almost exactly Minecraft in 2D, except even from the first screen you’ll notice little conveniences that its 3D inspiration lacks. Most notably, NPCs. Even more notably, the first NPC you meet is a guide. He actually tells you things that you can/should do to move the game along. If Minecraft had one of these, I would have gotten addicted to it twice as fast. They also start you off with a few tools, which saves you the trouble of punching trees, but this is less because they wanted to save you time and more because there is no way to manually do certain things. Trees can only be knocked down with axes and the environment can only be mined with a pick. If they didn’t start you with at least those two things, you’d never be able to get started. I don't know what those gems are, but I WANT THEM! 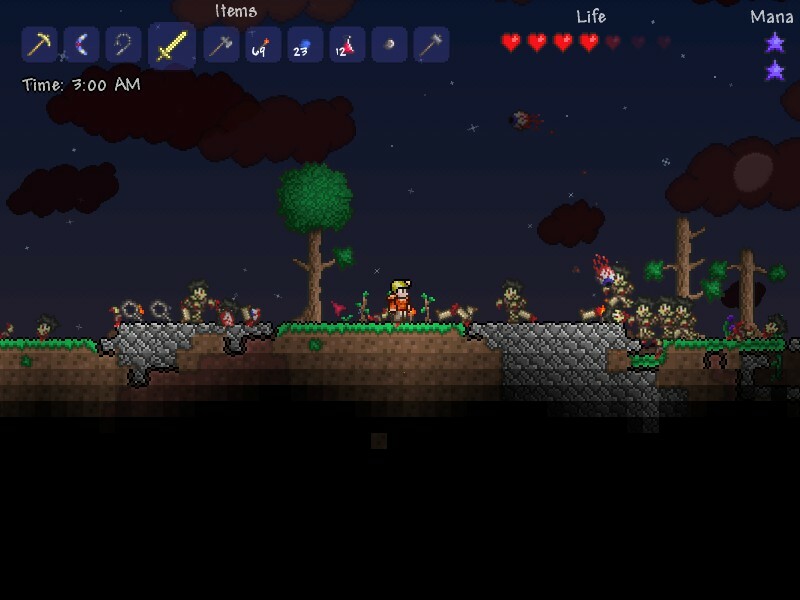 The combat in Terraria is easily as good as the games of the era that it borrows its appearance from. 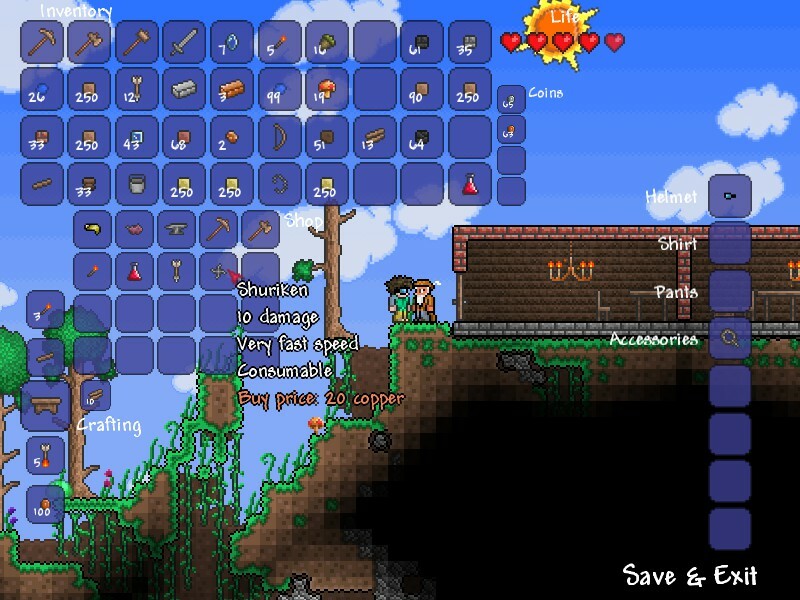 You’ll probably start by whacking things with your ax or pick, but before long the weapon variety starts to show itself. Even in the very beginning you’ll be getting swords (short AND broad varieties), well as bows and arrows (and FLAMING arrows). 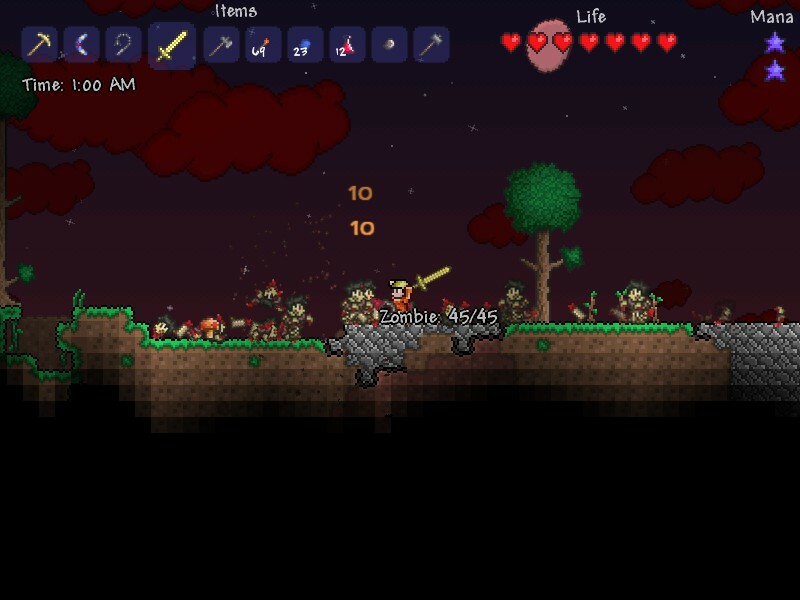 Night time brings zombies and flying eyes, and battling them is simple and well implemented enough for you to juggle a half dozen foes at a time with even starting equipment. 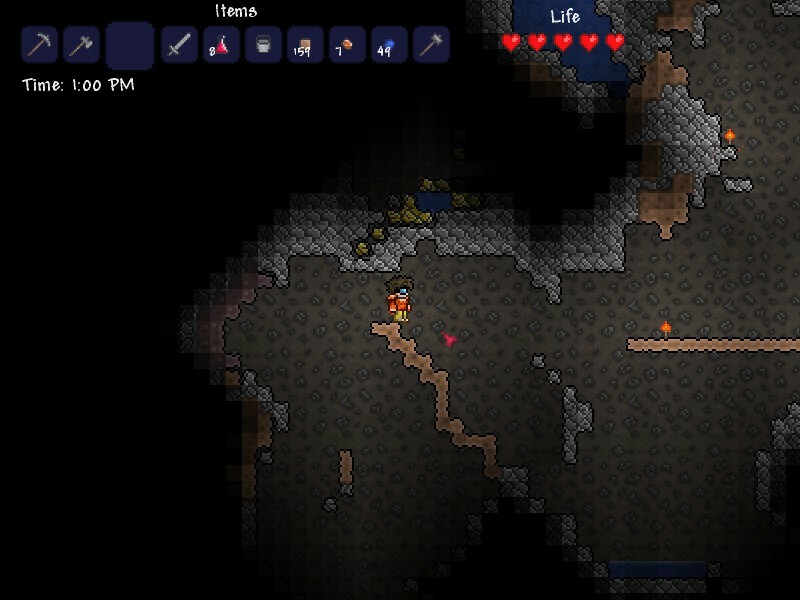 If you travel too far from home, you’ll begin to find corrupted areas with bigger, badder enemies. That’s okay, though, because the eventual arsenal will include boomerangs, grenades, firearms, and lightsabers. Yes, lightsabers. 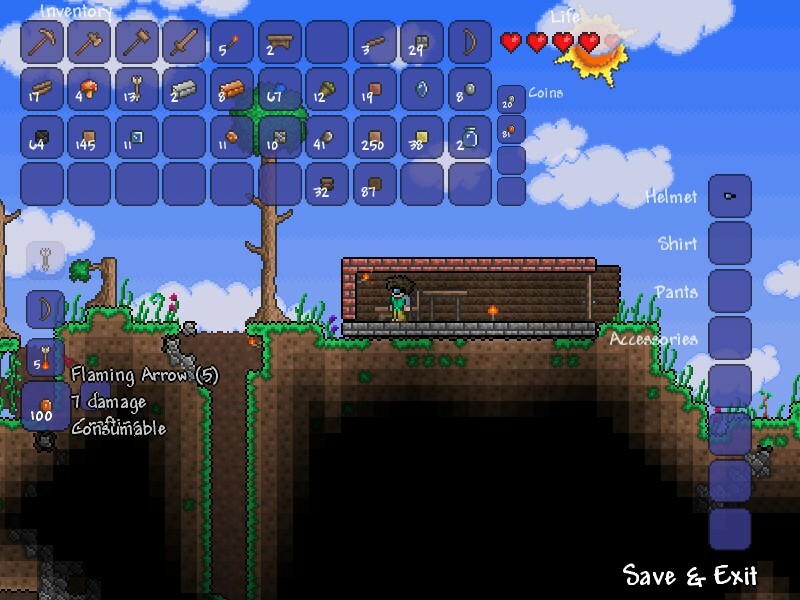 Along with the usual shirt, pants, and head armor slots that you would expect, you also have five accessory slots, which eventually will hold items that show you the time or your altitude, or perhaps increase defense, increase speed, give you double jump or triple jump, or even make you immune to fire. Good stuff. In time, if you think you are tough enough, you can summon up a boss encounter, doing battle with a massive skeleton or the eye of a Lovecraftian horror. Okay, so you may now be thinking, “So they added elements of Minecraft to a platormer, big whoop.” Well, if you chat with the guide for a while, you’ll learn that he isn’t the only NPC in the world. 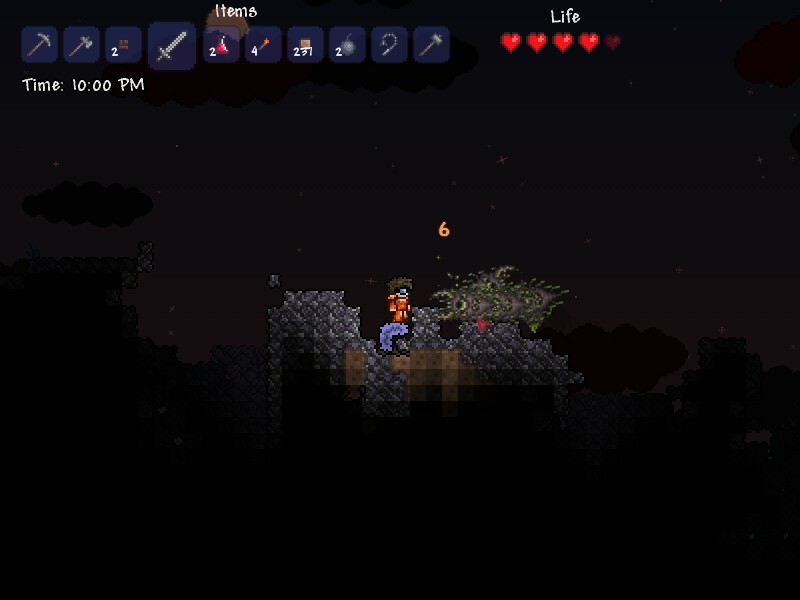 Building homes that fit very basic criteria, then achieving a specific task will attract a merchant, a demolitionist, a dryad, a nurse, and an arm’s merchant. 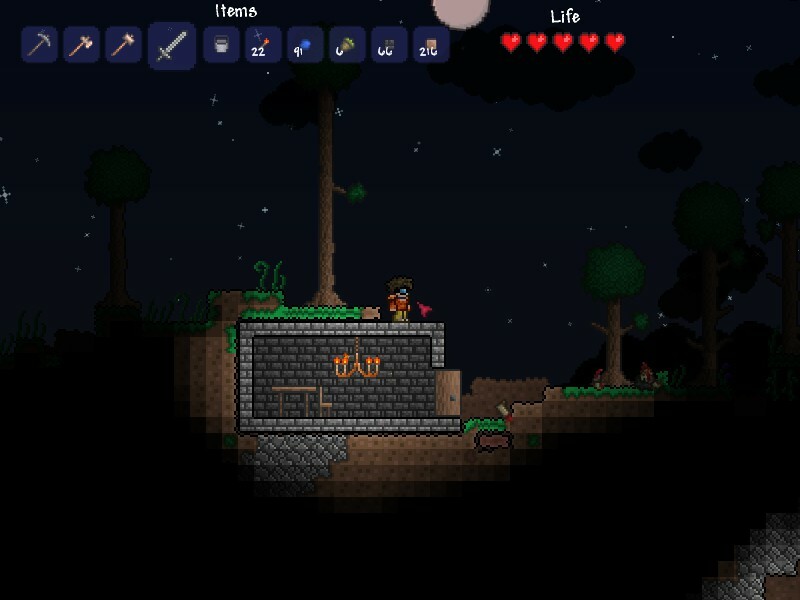 You can then buy various obvious items from them using the money you get from killing enemies. So there is a little bit of sim city in the mix. 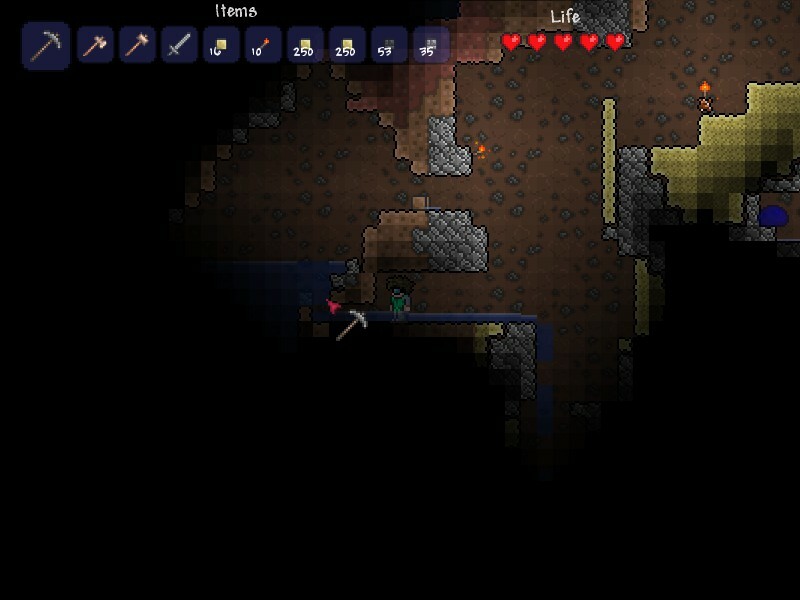 Mining Cap + Enchanted boomerang. Two things Minecraft badly needs. Overall, the thing that strikes me most about his game is the way that every few hours of gameplay reveal another item or feature that not only hugely improves the experience, but would have been perfect additions to Minecraft. Can’t see? Well, you can carry a torch along with you, rather than it only making light when it is placed. 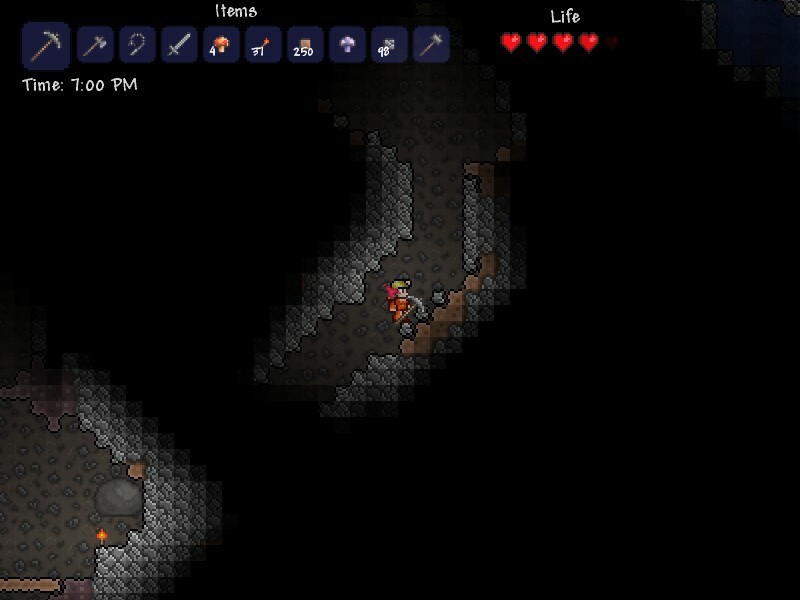 Afraid to jump down that dark hole? Toss a torch in, it stays lit as it falls, showing you what you are getting into. Want to fight or mine AND see, but don’t want to leave an endless chain of torches? The merchant sells a mining cap with a light in it! 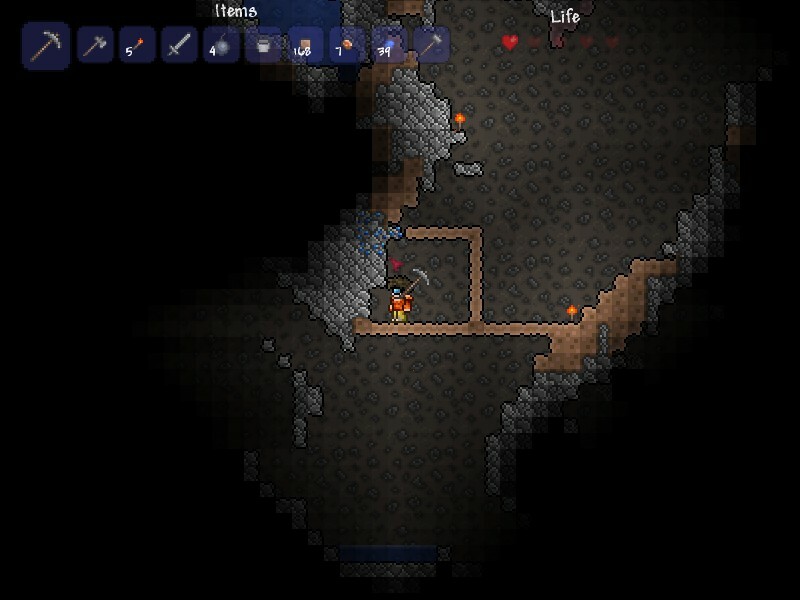 WHY IS THIS NOT IN MINECRAFT? Having trouble getting around? Well, just combine these hooks with these chains and you get the grappling hook AKA Link’s hookshot. Can’t seem to stay alive? Hidden in caves are crystal hearts that permanently increase your health, and crafting fallen stars can do the same to your mana bar… yes, you get magic, too. As the game progresses you start to gain items like rocket boots and space guns, items that help you breathe from further under the surface, you name it. The sheer size and depth of the gameplay is mind boggling. I put 15 hours into this thing and barely scratched the surface. Now that you’ve read all of that, think about this. I didn’t even mention the fact that it has multiplayer. Yeah, there’s a lot to this title. Like the visuals, the music is fairly retro. There are songs to indicate day and night, meaning a watch isn’t strictly necessary to tell time. They also give musical cues when you dig deep enough to be encountering the beefier baddies. Most enemies make semi-distinctive noises, and the stereo audio means you can tell which side they are approaching from. One particularly effective piece of audio work is the sound of burrowing worms, which gets louder and faster as they get close to you. 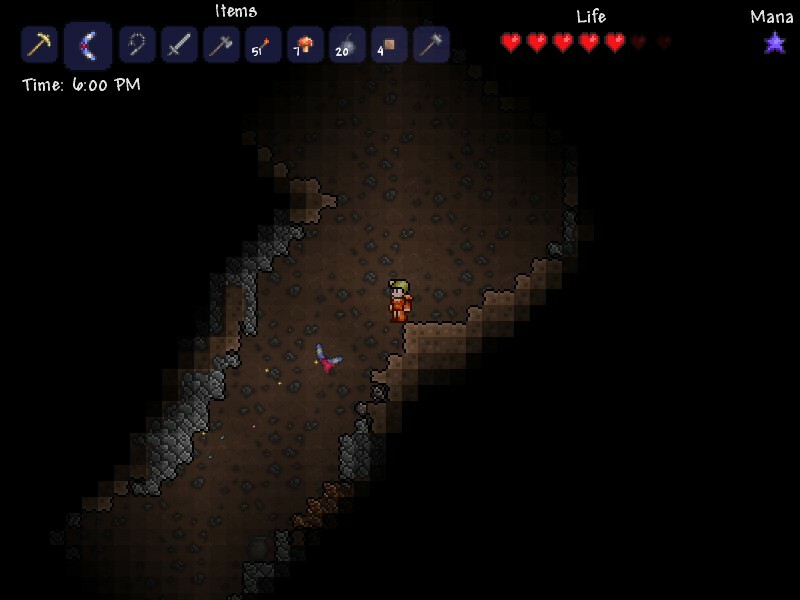 It is really effective at freaking you out early on when those suckers are a major threat to your meager health bar. The story isn’t really laid out for you, but there are elements of the setting that speak of a backstory. 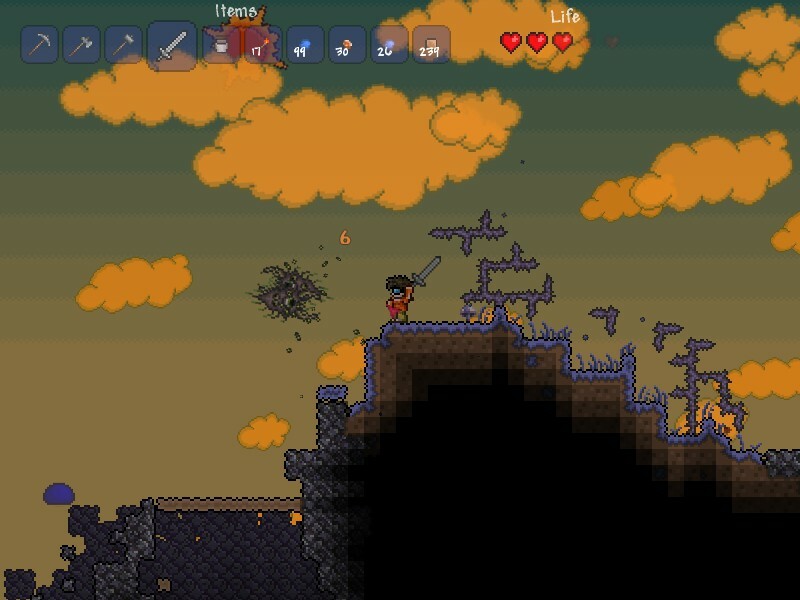 The corrupted areas, for instance, and the periodic and intense “Blood Moon” sequences that multiply the zombie and eyeball threat. There is even the threat of goblin invasion. Like most elements of this game, consider the plot of the game yet another part of the canvas for you to fill in yourself. I love Minecraft, I do. I was hooked on it for a while, and if not for a time crunch, I still would be. Even now I run a server for those of my friends with more enduring addictions. 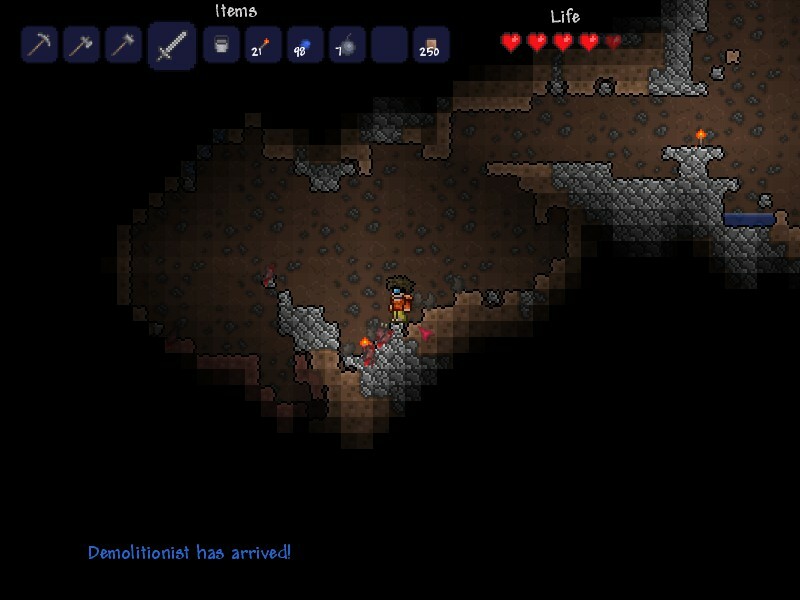 But comparing this game to Minecraft with one less dimension doesn’t even come close to describing it. It has so much to offer, and is so much slicker and more streamlined in comparison, that simply calling it a 2D alternative is the oversimplification of the century. Instead, think of it this way. 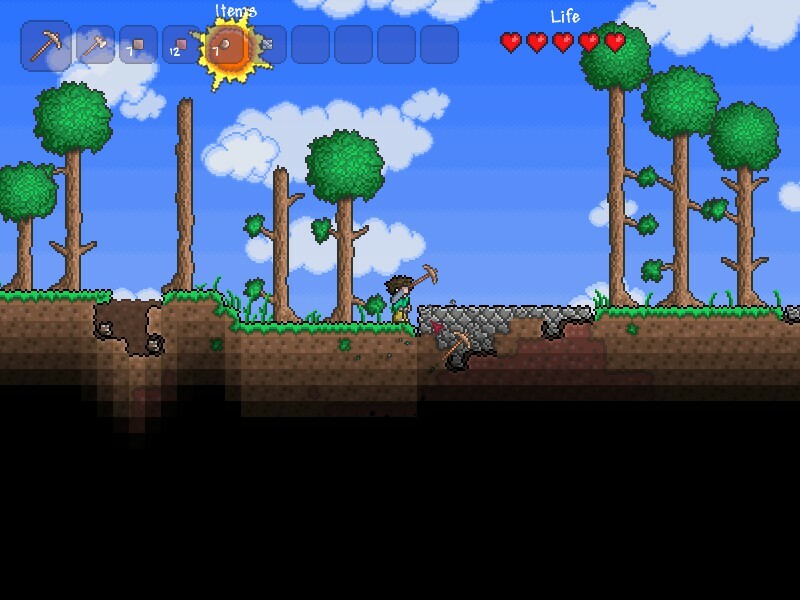 Minecraft is a sandbox first and a game second. 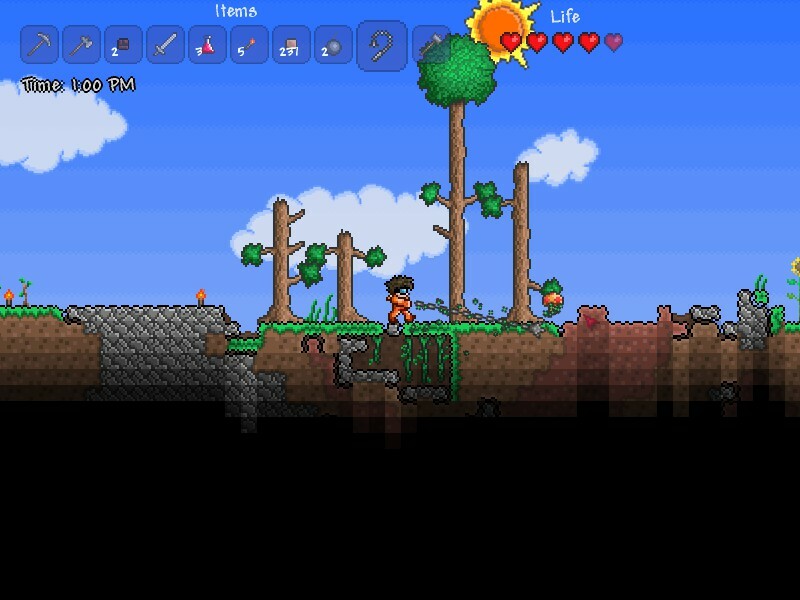 Terraria is a sandbox game. And a damn good one. 10 / 10: The 2D sandbox game to end all 2D sandbox games. Eagle eyed readers will recognize this color scheme. Sure, I could have just used a candle, but his house is for the demo man, so I’m going with a chandelier. I don’t know what those gems are, but I WANT THEM!